Hey, I'm really sorry but I completely forgot to tell you my new country name. Would I be able to change the name and give you a new flag or is it too late? The first game began with a bang for March, but thanks to an outball in the next serve, Kasim quickly caught up with him, and then it was constantly trading points, until they both reached 40. Kasim didn't win any more points after that, paving the way for March to gain advantage and win, Win-40. The next game began in a similar fashion, but with a netball instead of an outball. It was a very heated game, and it wasn't too long before Kasim had hit a netball himself, equalizing the score at 40-40. The game continued, and eventually March hit another netball, putting Kasim ahead of him, with an advantage. March quickly deuced him 4-4 however, and it wasn't too long before there was another deuce, at 5-5. After this, March pressed ahead, gained advantage, and beat Kasim 5-Win. The third game was also hard fought, with an outball from Kasim and a netball from March, and a deuce at 4-4, but eventually, March gained advantage and won the game Win-4, also winning the set 3-0. The first game of the second set went relatively well for March, as despite two netballs, he won the game 30-Win. Thanks to an outball from Kasim, he also won the next one, Win-30. Kasim struck lucky in the third game, as, after a relatively long game, he got advantage and beat March Win-40, despite a netball from his side. He quickly gained advantage and defeated March in the fourth game, again 40-Win. Game Five was quite short, and ended in a win for Kasim, Win-30. He won Game Six as well, despite an outball, and partially thanks to two netballs from March. The game ended 40-Win in favor of Kasim, also ending the set 2-4, in favor of Kasim, making the chances of victory for him around 50-50. In the third set, March quickly cruised to victory in the first game, winning Win-30. The next game was harder fought, with an outball from March and a netball from Kasim, but March eventually got advantage and won that game as well, 40-Win. He again defeated Kasim in the third and final game of the third set, winning it Win-30. Despite having lost the game to Joe March, Tahirudin Kasim is still far ahead of him in the ITL rankings, being №3 in the entire League. Joe March will advance into the Quarterfinals, while Kasim is out of the league for the rest of the season. That's all for now. Come back, hopefully tomorrow, to see the Sunrise Empire play the Socialist Republic of Matinenda. This is William White, signing off, and thank you for watching. Points go 0 ("Love")-15-30-40-Game, and you must win the game by two clear points. Server's score is announced first, eg. 15-30, 30-all or 40-Love. When one player wins the game, its just "Game <player>", without the score. 40-40 is called "Deuce", the next point is "Advantage <player>", and the next is either "Game <player>" or "Deuce" again. The Deuce-Advantage cycle continues until someone wins by two clear points to get to "Game". Note that in reporting a game, these scores are never even mentioned - only that the player held serve or broke serve by winning the game. Sets are first to 6 games, but again you must win by two clear games, so sets that get to 6-5 will either end at 7-5 or continue to a tiebreaker with the score at 6-6. Tiebreakers are a single winner-takes-all game under a slightly different scoring system - first to 7 points, again with the win-by-two rule. Only the losing score is reported for a tiebreaker, since the winning score is either 7 (if the losing score is 5 or less) or 2 + the losing score (if its 6 or greater), so the score for the set ends up looking like 7-6 (4). Tiebreakers continue until someone wins by two, which can result in very long games. Tiebreakers also do not always apply to the final set of a match, which then continues as per normal until one player wins by two games. This rule allowed Mahut and Isner to get to 70-68 in the fifth set of their epic. The match is won by the player who wins more sets, usually in a best of three or five. 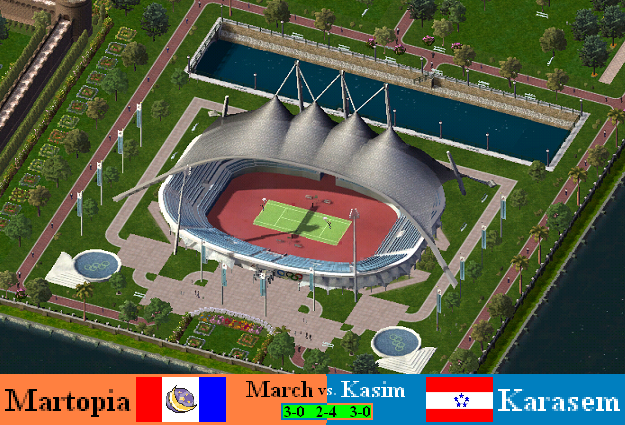 Very briefly, March broke Kasim in the second game to lead 3-0. Note that the set isn't over until he reaches 6 at least, and that none of what happens within each game warrants specific mention. It looks like March broke Kasim again in the first game of the second set, who broke back twice in the fourth and sixth games. Kasim currently leads the set 4-2. Again, it cannot be finished at this score. March again broke early to lead the third set, 3-0. There should be at least 3 more games left in the first and third sets, and at least two in the second. In major tournaments men normally play five sets as well. The results are in for the first game! Unfortunately, no picture is available at this time. Alessandro Monnaci of Cattala has won the match! Tune in again next week to see the contest between Meridania and Syldavia! This is William White, signing off, and thank you for watching. Better luck next time Athens County.